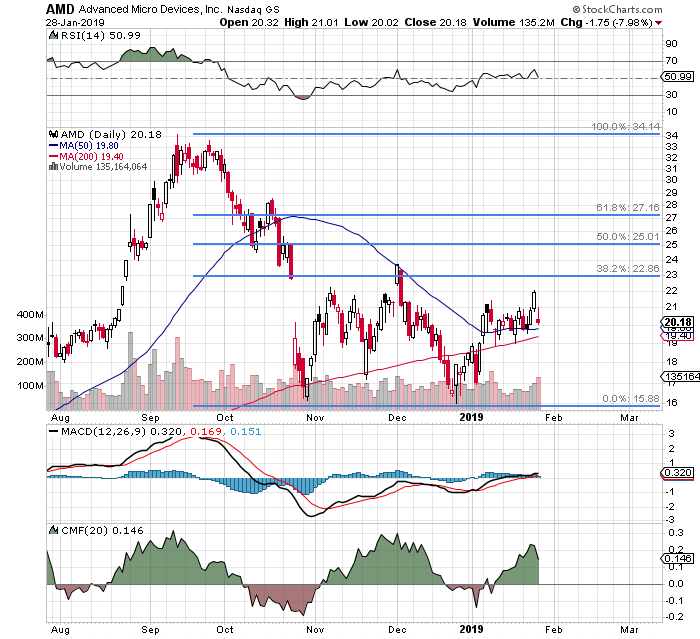 Advanced Micro Devices (AMD - Get Report) reports on Tuesday night. These shares, in dollar terms are cheap enough to survive a mistake, and cheap enough to manipulate post-earnings, which is really how positions must now be looked at and understood. Sort of similar to Intel (INTC - Get Report) in some ways, and also similar to Nvidia (NVDA - Get Report) in others. One might expect AMD to get hit in the teeth. Then again, I think an awful lot of Lisa Su's abilities as an organizer, and her ability to anticipate markets. This may be a lot to ask of anyone, however. Over the past couple of months every revision to revenue expectations for this quarter has been negative. Every single one. Let's take a look. What we have seen of late from a number of chip producers really might be interpreted as pre-recessionary, in not just terms of earnings, but if persistent, also in terms of economic growth. Remember, the economy runs on semiconductors. We're living in another era without them. We're not growing if nobody needs them. The street is looking for Q4 EPS of $0.08 on revenue of $1.44 billion from AMD after the closing bell on Tuesday. That revenue number if realized will print at -2.7% y/y. Not only that, $1.44 billion would be the lowest revenue number for the firm since Q2 2017, but also the worst performance in terms of revenue growth since Q1 2016. There is some good news. Lisa Su has already told us that the negative impact from a lack of demand from crypto-currency miners should be "negligible". In terms of pricing, AMD is not out there on the high end with NVDA, nor, according to Stifel's Kevin Cassidy, are they as exposed to the cloud. Cassidy maintained both his "Buy" rating as well as his $34 price target on Monday. AMD still needs the Chinese market, however at least historically, the firm's dependence upon Chinese markets as a revenue driver in percentage terms is far less than many other chip producers. I am honestly not crazy in love with the stock. There may be however, a certain value here not present in the competition. In addition, short interest has been on the rise. For those new to trading, while shares held in short positions are bets against a stock's performance, large or rising short interest in aggregate is often considered by traders as a bullish indicator. Why is that, you ask? I'll explain briefly. AMD runs with a float of 881 million shares. As of two weeks ago, 129 million shares of AMD were held in short positions, up from 114 million shares a month prior. Think about that... 14.6% of the float is basically a stamped buy ticket that will likely feel some pressure if the stock were to move higher. Hmm. The stock's average daily volume over the past 10 days is about 82.7 million shares traded. At that pace if every single share traded was purchased by a trader short the stock, it would take a day and a half to clear the short interest. The truth is that these shares have repeatedly enjoyed $16 support, while running into trouble at $22. The 50 day SMA is getting a little too close to the 200 day SMA for comfort, despite Relative Strength and a daily MACD that don't offer much guidance. Money Flow has been strong of late, and volume has been higher on down days than on up days of late. The stock pays no dividend, meaning that investors can afford to be more patient. Basically, I don't want to own the shares here. I want to own them at confirmed support or on a break of resistance. As for equity, I am willing to own a chunk at a 20% discount but still want to stick my toe in the water if this magical discount never materializes. I do not need immediate equity exposure. I am fine in waiting for my pitch, not forcing anything. Notes: The trader in this example has created the possibility of benefiting form a potential post-earnings short squeeze, while selling $16 protection to other traders in greater size. If this entire strategy expires worthless, out traders net a credit of $2.09. If in April AMD had crashed, this trader will end up long 400 shares at a net basis of $15.48... if the trader chooses not to repurchase the puts. At the time of publication, Stephen Guilfoyle was Long INTC, NVDA, Short INTC calls, Short NVDA puts.